Angelfish is the name of a popular aquarium fish native to slow flowing rivers and streams in South America. 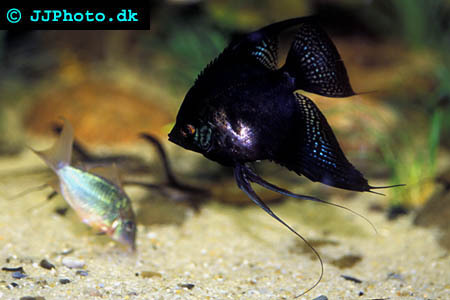 Its scientific name is Pterophyllum scalare, and Angelfish is therefore often called Scalare. When you set up an aquarium for your Scalare, you should try to make the aquarium resemble the natural environment for a wild Scalare. The slow flowing rivers and streams in South America where wild Scalare is found are typically densely grown with algae and aquatic plants. You Scalare will therefore fell more safe and stress-free if you keep it in a planted aquarium. Live plants are preferred. A common aquarium plant that is native to the natural environment of the Angelfish is the Amazon Sword Plants (Echinodorus). It is a hardy plant and can be found in more than 50 different species. Since it originates from the same waters as the Angelfish, both plant and fish will appreciate the same water quality when it comes to hardiness, pH-value, temperatures etcetera. Other examples of suitable plants are Java Moss (Vesicularia dubyana), Java Fern (Polypodium pteropus) and Water Sprite (Ceratopteris). The Scalare prefers slightly acidic water. They will usually do best if you manage to keep the pH between 6.5 and 6.9. The water in their natural environment is very soft, and the water in the aquarium should therefore ideally be from 0.6 to 1.2 dH. To ensure good water quality frequent water changes must be performed. It will be easier for you to make sure that the water chemistry is ideal if you place live plants in the aquarium. Many plant species are more sensitive to water quality changes than the Scalare, and will function as ‘canaries’ and alert you before your Scalare becomes affected. If you do not keep live plants, one of the first signs of poor water quality will be that your Scalare refuses to eat. How large the aquarium must be will naturally depend on the size of the fish. The largest common Angelfishes are around 6 inches, and the Veil variants of the Angelfish will have an even longer distance between the top and bottom fin. Required aquarium size will also depend on how many individuals you intend to keep together. Since Angelfish is often kept with other species, the requirements of those species and their interaction with the Angelfish will affect the necessary size as well. Your Angelfish will do best on a varied diet. Angelfish accept most prepared foods, and e.g. flake foods are a good base for this fish. There are several dried foods available on the marked nutritious enough for an Angelfish. They will however do better if you also include other types of food in their diet, such as black worms, chopped up earthworms, brine shrimp and mosquito larvae. Angelfish also love finely grounded beef heart mixed with unflavoured gelatine. This food can preferably be stored in the freezer, which makes it a convenient food. Just make sure that you never allow any fat to be included in the preparation. Scalare are known to sometimes embark on hunger strikes, especially if kept in an aquarium with poor water quality. If your Angelfish stops eating your should always check the water quality and perform water changes. The next step will be trying to convince your Angelfish to start eating again. One of the best ways is to tempt the Angelfish with live food, e.g. live Brine Shrimp or some live Guppies. If your Scalare has an individual favourite food, this food is of course also a very good suggestion. Compared to many other tropical fish frequently kept in aquariums today, the Scalare has proven relatively resilient to diseases. When the Angelfish gets ill, it is usually suffering from Exophthalmia or Ichthyophthirius. Ichthyophthirius is a very common fish disease caused by a protozoan parasite, the Ichthyophthirius multifiliis. The illness is also called White Spot Disease or just “Ich”. The parasite causes white spots to form on the body of the Angelfish. You can treat an Angelfish infected with Ichthyophthirius with special Ich medication. Most pet and fish stores sell ich medication, and will also be able to help you with instructions about how to use that particular brand of medicine. Keep in mind that the Ichthyophthirius multifiliis parasite goes through tree different life stages. The skin of your Angelfish is inhabited by adult ich parasites. The white spots are actually the result of adult ich parasites feeding of body fluids and tissue. The mature ich parasite will eventually leave the skin and fall to the bottom of your aquarium. At the bottom, the ich parasite begins to multiply by dividing it self. One ich parasite is capable of producing more than 2000 new parasites. The newly formed ich parasites will be swimming around in the aquarium and are capable of infecting a susceptible fish as soon as they find one. During this stage, when they are still swimming freely, they are as most vulnerable. Ich medications will therefore be most effective against parasites in this stage. You should therefore raise the water temperature to around 80 degrees F before you start the ich treatment. The warm temperature will speed up the life of the parasites and they will fall to the bottom of the aquarium more quickly.